'Designed by iriver Korea' reads the back panel of this expensive, blocky gadget with retro volume knob and colour touchscreen. The Astell & Kern AK100 looks like a BBC presenter's radio pack from 1971 and reads like a funeral home but it is actually an audiophile music player, able to eat your iPhone 5 for breakfast and do your premium headphones justice. So far, so good? The kicker is it costs £569 - in the age of iPhone and cheap Android smartphones, is it worth it? The retro design is at odds with the touchscreen controls, but build is solid and the physical buttons and volume dial are actually handy when sat at a desk. You don't have to consult the screen if you don't want to. There's a slot for two Micro SD cards (up to 64GB each) which augments the 32GB of internal storage. The slots are slightly tricky to use, but secure. After living with the player for a month, the small, rugged build is practical and simple enough to look at home on your lap or in the office. The Wolfson digital-to-analogue converter is a surprise inclusion in a portable player and usually found in hi-fi amps or add-ons which are 20 times the size of the dinky AK100. The menu system divides your album art and track names. There is software for your laptop but it's old fashioned and no match for iTunes. Sync is wired too - no cloud skills here, though there is a useful Bluetooth mode for streaming. Whatever files you chuck at the AK100, whether it's 24-bit Flac files at 96MHz or Apple Lossless files, the AK100 does a good job of filing them and putting the highest resolution files in a Mastering Quality Sound folder if they meet the required 24-bit quality. Selecting tracks can be buggy at times and the interface is slow, but get used to it and it's worth the struggle - you'll end up listening to full albums and rediscovering your favourite tracks. Despite the user interface compromise, we haven't returned to our iPod Touch 64GB since the AK100 arrived in the office. The twin 64GB MicroSD card slots mean the total 160GB capacity (with extra memory cards) is, ironically, the size offered by the discontinued iPod classic. 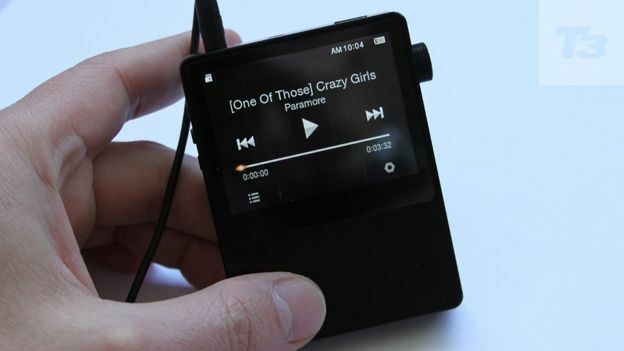 The AK100 is the best portable music player on the market and outperforms budget hi-fi too. Designed for headphones, the tuning is spot on when paired with headphones like the Sennheiser HD 25 IIs which are all about detail, but helpfully block outside noise effectively whether it's a bus or plane you're traveling on. Similarly, you should also look at the £269 Philips Fidelio X1s and the Denon AH D600s. Play a 24-bit Flac file of Guns & Roses live and you can hear immense detail, clear words from the crowd as they heckle and every string of Slash solos. Similarly, jazz and classical tracks showcase the detail and natural tones that can be passed to a pair of headphones. The benefit is best experienced with over-ears, but you'll spot the difference with decent in-ear headphones from Sony or Sennheiser. It's a leap from the sound output of an iPhone 5 because of the better audio hardware and lack of interference from actual phone hardware. Part of that increase is the ability to play Flac files too, which the iPhone doesn't support. If you're used to a great hi-fi at home, you'll always be disappointed by the nagging compromise of lesser quality sounds on the go, even through good headphones. The AK100 initially seems like an expensive solution, but practical at the same time. If you don't have a home hi-fi and can't be bothered with the faff of amps and headphone amps, but still want audiophile quality sounds, the value of the AK100 can be appreciated. Yes, it costs as much as an iPhone 5 but, the truth is, it sounds a hell of a lot better. If it's your main music system at home and on the go, the price is acceptable and for music lovers who no longer have space or time for tinkering with turntables and fitting power amps, it's the most accessible way of getting high-resolution music to your ears and, frankly, that's something worth shelling out for.